With less than a week to go now until the start of the World Cup, we brought together our SFG bandieras plus some special guests to run through the key talking points concerning the Asian nations taking part. Co-presenter of the insightful podcast The Asian Game, Australian Paul Williams, and Tavern of the Taegurk Warriors’s Tim Lee join regulars Tom Danicek and Martin Lowe in predicting Asia’s fortunes in Russia. 1) Best performing Asian nation? Tom Danicek: That’s just got to be Iran. Carlos Queiroz has managed the re-build very well, meeting just about everyone’s expectations with a dominant qualifying campaign, and with Jahanbakhsh, Taremi, Ghoddos, Azmoun in the fold he seems to have plenty of goalscoring options at his disposal as opposed to 2014. If Beiranvand and Pouraliganji somehow rise to the occasion, Iran should have a strong enough backbone to make waves, even in their group of death. Also, Australia, dare I say, made the best bet from among all options being thrown around post-Ange resignation and could spring some surprises with Bert van Marwijk at the helm. Martin Lowe: By far and away, Iran have been the best side in Asia over the last few years and it seems fitting that they’ll peak at the World Cup. While the draw has made progression feel a little distant to start with, having to play Morocco first might aid them before the heavyweights sides come to play. Queiroz’s Portugal connections are well known, and Spain are far from the attacking side they used to be. While others will quickly write them off, Iran feel to me like the Senegal side of 2002; talent in their peak ready to cause an upset. Paul Williams: This is a tough one to answer as no team is really coming in with exceptional form and a few teams are drawn in difficult groups. I think on form it will be difficult for any side to progress to the Round of 16, so in this sense there really isn’t one team that will do better than the other. Iran and South Korea have really difficult groups, and I struggle to see Saudi Arabia doing anything of note, so it would have to be either Japan or Australia. Tim Lee: I want to believe in Iran – I really do. This is a side I’ve grown to hate and respect, in equal quantities. Quieroz’s world-class defensive organization has walked the last two Asian qualifying cycles (though RIP Asian Cup vs Iraq), and there are vulnerabilities, like their pre-tournament drama and the dropping of Jalal Hosseini. And though of course questions remain if Iran’s defensive shape can really hold up and upset the defending European champions Portugal and the such-a-popular-dark-horse-it’s-almost-not-cool-to-support-them-now Morocco, I can only point to their 2014 match against Argentina. I’m willing to disregard all the questions and issues surrounding this side and accept that if there’s one Asian country that can upset the competition and pundits (since every AFC side is ranked low by every pundit, that any win by the AFC is going to be an upset) it’s going to be Quieroz’s stubborn football elevated by some Jahanbahksh and Azmoun magic. I think if any AFC country is going to make it, it’s them. 2) Will an Asian nation make it to the R16 (if not, who comes closest)? TD: A rather overwhelming no. At this point, rather controversially, I still think Japan would be better off at the World Cup with Halilhodžić than without (or with Nishino, to put it better), even if at the cost of Honda rebelling against boarding the same plane as him. Halilhodžić is a bit of a tournament coach for me, and that group would arguably be navigable with someone like him in charge. Saudi Arabia shot themselves in the foot with Van Marwijk too, but seem to be growing into it under Pizzi, so they would be my dark horse, alongside with Australia, who may easily end up quietly peaking at the right time, IF Bert gets his central midfield trio right. South Korea, on the other hand, are just a hot mess, and Iran are stuck in too strong a company, but if they manage to beat Morocco, then who knows. ML: As we edge closer to the tournament, I’m starting to grow hopeful that we will see something positive in Russia after a grand total of 0 wins from Asia in Brazil. For me Saudi Arabia have the best chance, despite being the worst of the five sides on paper. Their style of play is evolving, they’ve had a higher quality of preparation than others and their group consists of few heavyweights. Crucial to their hopes are to upset the hosts Russia in the opening match, a tough order but an achievable one. PW: Following on from above, on form it is really hard to see any Asian nation progressing to the Round of 16, which would be a major disappointment after the embarrassment of Brazil four years ago when none of the four nations managed to win a game. As mentioned I think Australia or Japan, given their groups, are most likely to advance. So I will be a little parochial and say it will be Australia who does best. TL: As stated above, I think Iran are in with a shout (the people probably want a definitive yes/no, so I’ll put my cards on the table and say yes). I think Australia will just miss out (hard to overlook France and Peru) but will, like in 2014, impress, leaving us with a satisfied but disappointing feeling. 3) Which Asian star will convince the most? TD: While Jahanbakhsh is still not hitting as high levels for the national team as he is at club level, Sardar Azmoun usually saves the best for Team Melli; stretches defences, holds up the ball, and scores important goals; be it after a solo run after sneaking behind the defence, or from up close with his head or otherwise. Even when he was out of form on the club scene, he would somehow show up for Iran. He just seems really motivated and focused every time he pulls that national team jersey over his head, and I already can’t wait for his incredibly cool finish to send Portugal home. ML: There hasn’t been a quicker rise up the footballing ladder than that of Aaron Mooy. From relative obscurity back in Australia with Western Sydney Wanderers, he’s now become a well sought after centre midfield in the highest quality league in Europe. For Australia, he excelled under Postecoglou, in both a defensive and attacking capacity. It’s to be seen whether he can have the same impact under van Marwijk in probably a more withdrawn role, and against some of the best centre midfielders in the world. I believe he can more than hold his own, and forge himself an even loftier place in the mainstream football opinion. PW: Alireza Jahanbakhsh. He is a superstar in waiting and after getting a taste of what a FIFA World Cup is all about in Brazil, this is his time to shine and show he deserves to be playing at the highest level in Europe. TL: Iran will have a lot of eyeballs on them on this tournament, not least because they’re up against Spain and Portugal, two behemoth sides that make for a ridiculously lopsided group. 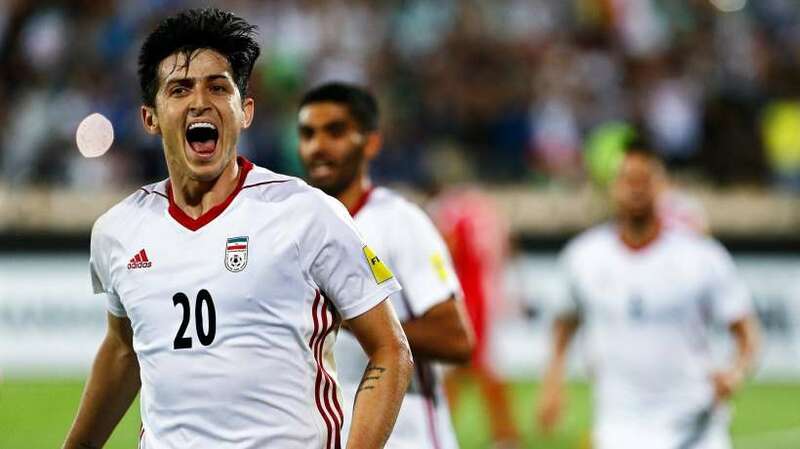 I think Team Melli are still the best side in Asia, and Sardar Azmoun – very original, I know – is going to make this tournament his international statement. Though his club form, as I understand it, has at times been speculative, he seems to be bitten with that Vargas’ gene of really impressing on the international stage. Iran’s style requires him to be everything that he is, that is to say, the aerial menace with the poacher’s instinct. His ability to score when it counts in Iran’s direct system, both from good service of Alireza Jahanbakhsh or his exceptional heading ability, will be fundamental to what I’m calling Iran’s surprising win over Morocco coupled with inevitable scare against Portugal. 4) Which Asian star will disappoint the most? TD: Son Heung-min just doesn’t seem to do it for South Korea when the scrutiny runs highest. His efforts in that damn Olympics quarter-final against Honduras, in particular, were just one huge, painful spasm. He choked there in a very individual way, wasn’t overly impressive in the WC qualifiers either, and ended up trying way too hard even in pre-World Cup friendlies, like vs Bosnia. I might be harsh on Son sometimes, but truth is, one lost Asian Cup final aside (where he stepped up), he tends to crumble under increased pressure, feeling it all too much. I really wish he proves me wrong in Russia, but I’ve seen next to nothing recently to also foresee it. ML: It’s been a miserable downturn for Shinji Kagawa in Samurai Blue. Ignoring his domestic form which have been pretty hit and miss throughout his career, he plainly hasn’t lived up to his potential for Japan. He’d unlikely get into the squad without his profile and even if he does get on the pitch, I can’t see him inspiring a team that really lacks ideas in the final third. When you consider the likes of Yuya Kubo and Shoya Nakajima are sat at home, Kagawa needs to prove his worth not to be seen as Asia’s greatest disappointment at this World Cup. PW: Hopefully none, it would be great to see all players do well. But I’d say it is set up for Keisuke Honda to disappoint unfortunately. I have to say, I hope he doesn’t, but given Halilhodzic was axed, which was pretty much to ensure Honda was selected, unless he really delivers and helps Japan to a Round of 16 berth then anything else will be a disappointment. The JFA are building this team around Honda, it’s up to him to deliver. TL: I’m not sure how much of a disappointment this is, and in truth as a Korean expert this one is a bit of a crapshoot. But I do expect Saudi Arabia to have a poor tournament, and that’s not least because of their defence. Osama Hawsawi has over 134 caps for this side and will be asked to patch together the Saudi defense in a poor group to try and secure a Round of 16 qualification. I don’t see it happening, and I see Hawsawi, as the captain of the Saudi side, to prove disappointing as the defense’s general. From what I’ve seen, against higher-level opposition, Hawsawi can prove to be error-prone and sort of panicky, in spite of his qualities. I don’t see them losing 8-0 like against Germany in 2002, but I can’t see them – or Hawsawi in particular – stop the bleeding either. 5) Which Asian player will surprise the most? TD: Lee Jae-sung. For me, there’s literally all to like about this guy. As a leftie (usually, for the national team) coming from the right wing, Lee Jae-sung offers unpredictability, waving runs, slicing passes and one-twos wherever he goes. He never hides, doesn’t mind getting stuck in with a sliding tackle, and overall reminds me of a young Rosický, only that Lee can head some balls into the net as well, arriving late to the box. All in all, with Go Yo-han , if selected, also being intelligent and keen on supporting the offence, I can see South Korea’s right flank to be the area where most actual danger stems from. Even as a fairly fresh KNT member, Lee Jae-sung is beginning to make this team his own. ML: An exciting inclusion at the start of van Marwijk’s tenure with Australia, Andrew Nabbout has come to symbolise the new Socceroo set up. Unfussy, direct and effective. His bullish frame and quick acceleration will be perfect to come to the fore against France, while his long range shooting ability can also be useful in the other two matches, where possession should be much more open. PW: Hopefully there are a few. As an Australian it would be fantastic to see Daniel Arzani get some game time and shine on the world’s biggest stage, and I hope a player like Lee Jae-sung, who has been a standout for Jeonbuk for a number of years, can take the opportunity to show he deserves to be playing at a higher level. There are so many though – Hwang Hee-chan, Sardar Azmoun, Takashi Inui etc etc. TL: If Korea is to do anything in this tournament, it will absolutely, totally be because of Lee Jae-sung. His success shouldn’t per se be a surprise to those who closely follow Asian football, but he certainly has the potential to be a big surprise for the casual viewer or European-centric watcher. Watch one game of South Korea, and chances are you will see Lee as an instigator of quick, one-touch passing plays all while remaining mobile in what will likely be a quite energetic and rapid strike force. He’ll contribute to Korea’s high press but also prove extremely annoying with combativity and by proving unafraid to take a tackle for the team. The Jeonbuk midfielder has been set for a couple years now for a move to Europe, and though his loss will be felt in the domestic league, his is a player that boasts too much quality for Asian football. 6) Who will win the World Cup and why? TD: While I am more and more convinced Tite is *the* guy for Brazil, it just seems too good to be true all of a sudden, plus I am genuinely failing to see an obvious weak point of the Spain side. All positions seem to be doubled up to near perfection, so much attacking talent, with varied skillsets. My only worry would be Diego Costa as the leading striker, but then again, this side should have no trouble whatsoever to find some secondary scoring. ML: It feels like there’s a gulf between the top four and the rest. And while I can find reasons why three of them may stumble, Brazil seem to tick all the boxes. World class talisman in Neymar, check, a deep squad with options all over the pitch, check, a tactically impressive manager, check, and most importantly the incentive, check. No one will be out to prove their worth more than Brazil given what happened four years ago. While Germany and Spain have been there and done it for so long now, the return of Samba looks to be coming. PW: Twenty years on from their last success I have a feeling this is France’s year. They have exceptional quality across the park, which is highlighted when you look at the players they left out of their squad, and seem very well balanced. TL: I’ve flirted with Brazil and am convinced by Spain, but ultimately my gut instinct tells me Germany just have all the pieces. It’s their tournament to lose, and it’s for a reason. Their squad’s balance, depth and consistency won them the day in 2014, and it’s hard to pinpoint one position where they’ve declined in quality this time around. The return of Manuel Neuer will make a strong German defense even more impossible to beat, while Timo Werner’s inclusion makes this well-oiled German machine even more formidable with a legitimate and trusted centre forward threat. Ultimately, Jogi Löw’s experience, Germany’s tournament know-how, infusion of youth and indomitable veterans and their ability to exploit any weakness the bigger nations will expose makes them my horse in the race. 7) What are you most looking forward to? TD: Group B action. Reigning European Champions with a somewhat refreshed attacking line, now featuring two exciting Silva’s; my favourites for the title; and arguably the two best performing sides from Africa and Asia respectively… all coming up against each other, in clashes of 4-4-2, 4-3-3 and 4-2-3-1 formations. What more could we ask for, really? Oh yes, Renard and Boussoufa taking the centre stage for the first time in their careers, that. ML: Ironically I’m looking forward to something that I can’t wait to see the back of – the VAR. It’s been long enough now that we’ve seen it in smaller tournaments fail – U20 World Cup, A-League, FA Cup, but the real impact will be truly showcased at the World Cup. I’m ready to eat my words but I feel sure in guaranteeing at least one team at this World Cup will go home due to a VAR “error”. While it might not be the case for those who see these decisions go in their favour, I think for many this’ll be known as the VAR World Cup, let’s hope it’s the last of them. PW: I just hope for a good performance from the five Asian teams. It was bitterly disappointing to see all four leave Brazil without a win and it did some damage to the reputation of Asian football across the globe. A repeat of that in Russia would set the game back immeasurably. TL: I’m looking forward – or even hoping – for a World Cup that makes a statement. Every single article and statement seems to once again cram all of the AFC sides at the bottom of the “power rankings”, with a couple CAF sides interspersed in the mid-20s and Mexico getting the lazy “they’ll easily qualify from the group but lose in the Round of 16” prediction while the rest of CONCACAF is forgotten. In a European World Cup, I’m looking forward to the one or two teams from the “Other” confederations that will make a deep run or cause a tremendous upset. Anything to make pundits give some of the other continents some respect will make me a happy man. (+ a Lee Seung-woo hat-trick vs Mexico please, preferably from dynamic and/or sumptuous Lee Jae-sung assists leading to a big European move! ).